I recently went to the small Asian market near my home and spent way too much time looking at Japanese and Chinese noodles. I finally picked four different varieties of noodles from some brand that seemed to be from an Asian country as opposed to American made. I have this crazy notion that Japanese and Chinese noodles should be made in Japan and China in order for me to feel like purchasing them. What I love, is that I found uncooked and un-fried noodles for less than $1 a pound, which for my large family of hungry noodle eaters is a wonderful blessing. I wanted to find noodles that were like the pre-packaged Ramen noodles, but not fried or packaged with a sodium laden dry powder sauce. I think I succeeded. One of the packages of noodles I chose were Soba noodles. 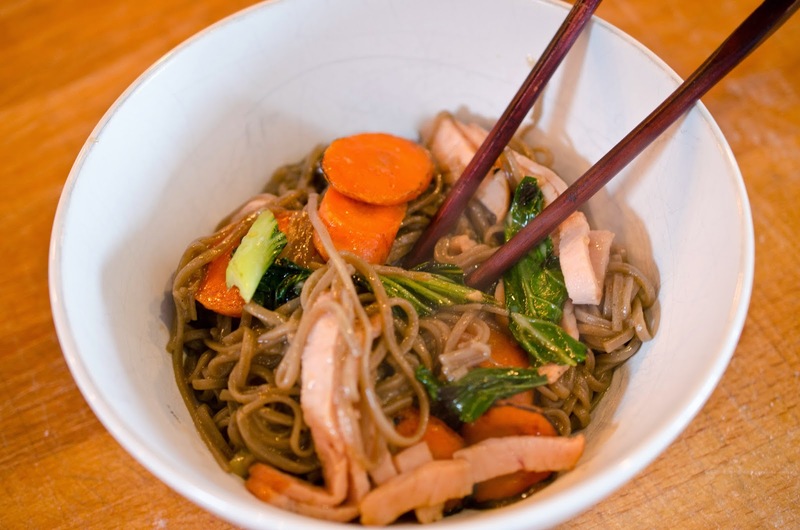 Soba noodles are made with buckwheat, which is not related to wheat at all. It is not a grass. It is related to sorrel (herb) and rhubarb (herb perennial). 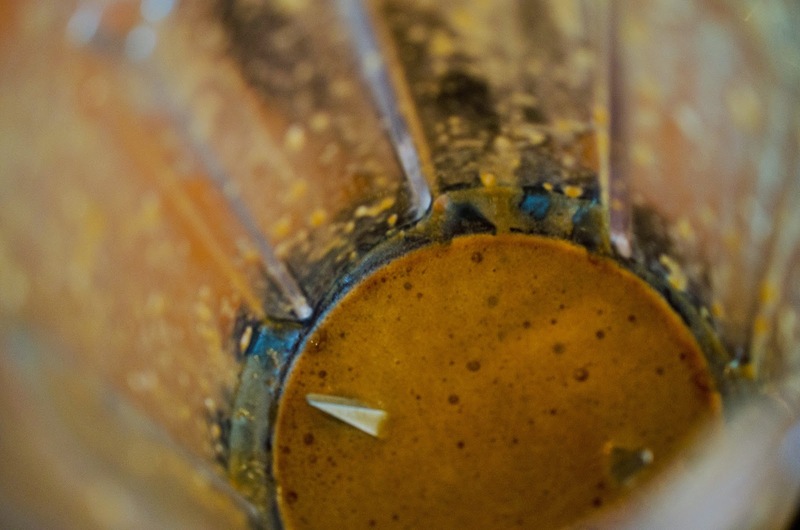 If you are gluten intolerant, or wheat intolerant, this recipe is for you. I have never prepared or eaten Soba noodles, so this was an exciting prospect for me. Today I was ready to prepare some Soba noodles and try them. I made up this recipe, so I used traditional Japanese flavors and ingredients, but I don't know how authentically Japanese my recipe is. I loved the colors, and the noodles were yummy. Cut bok choy into 1 inch pieces. Cut the carrots at an angle into 1/4 inch medallions. Cut Canadian Bacon into 1/4 inch slices. package directions. My noodles were cooked in five minutes. 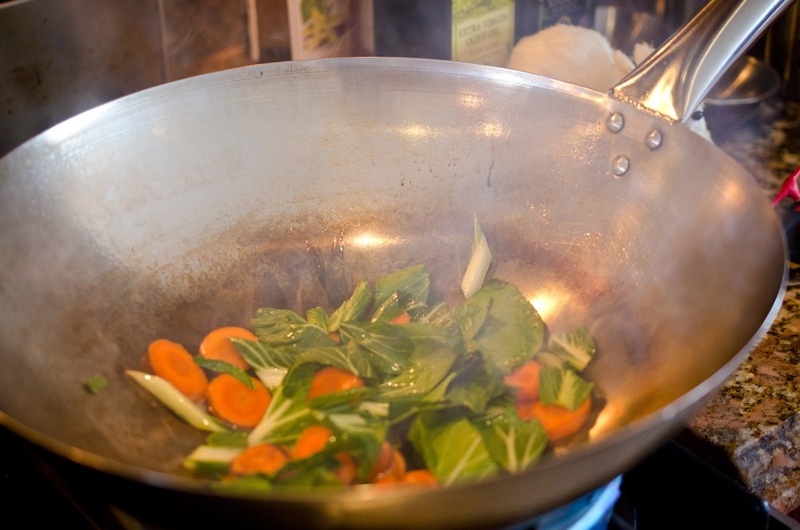 While the noodles are boiling, preheat a large wok over high flame until you begin to see some smoke. Open windows and turn on circulation fans if you can. I have two fans one in my kitchen window and the other in the adjacent living room window specifically for me to use when I am stir frying. 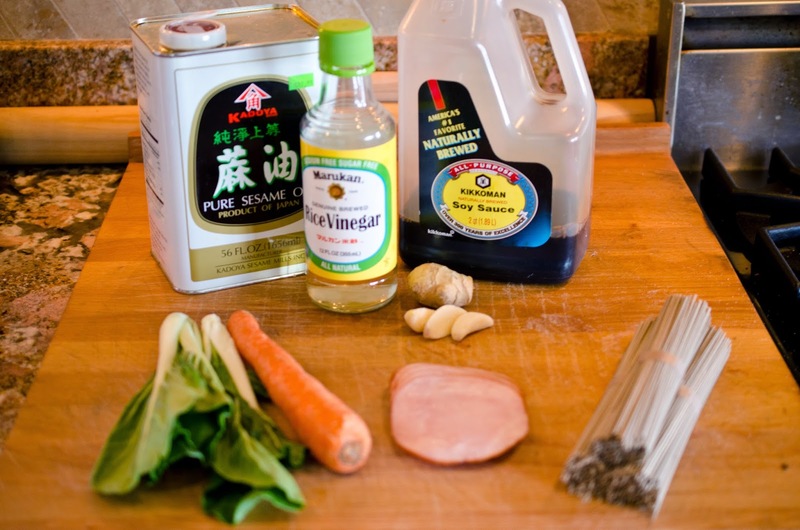 Stir fry the carrots in 1 tablespoon of toasted sesame seed oil for a couple of minutes, then add bok choy. cold soba but I wanted it to be like ramen almost. I love noodles, and now that I have eaten soba noodles, I'm sure I'll make them again. 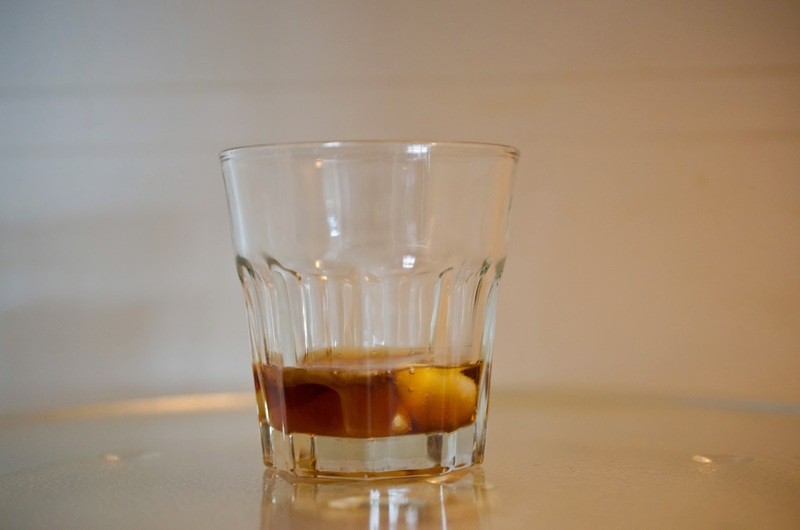 Microwave garlic for 30 seconds in 2 tablespoons of the quarter cup of toasted sesame in a glass cup. 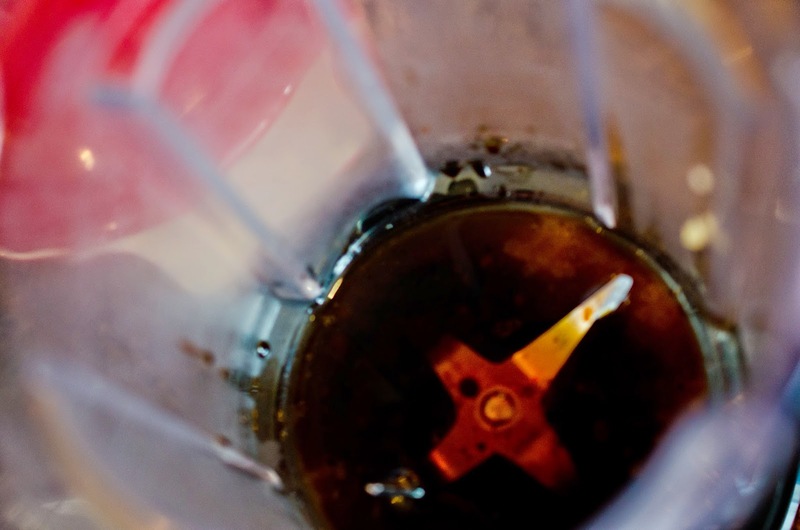 Pour soy sauce, toasted sesame oil, vinegar, garlic in oil, and grated ginger in a blender and blend till smooth. 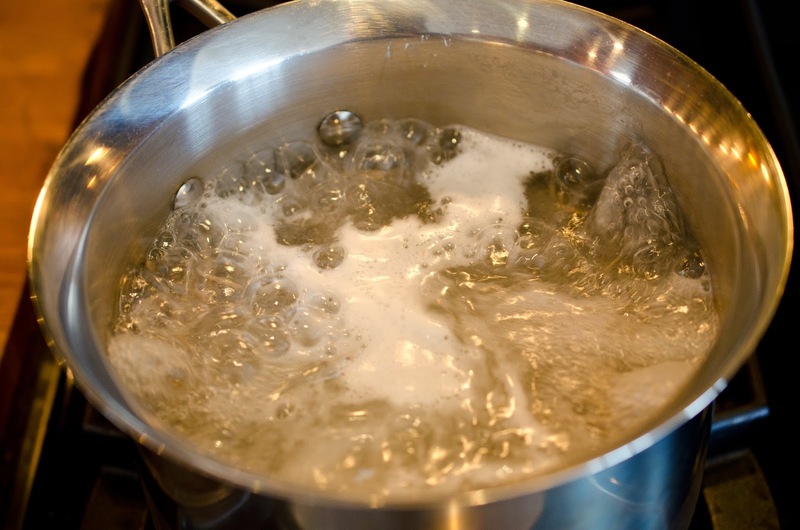 Bring a medium pot full of water to boil. Add salt and boil soba noodles according to package directions. While the noodles are boiling, preheat a large wok over high flame until you begin to see some smoke. Open windows and turn on circulation fans if you can. 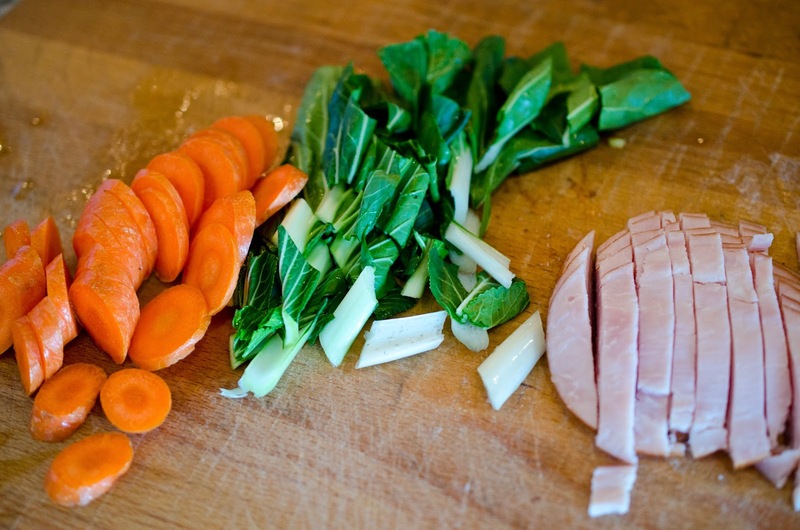 Stir fry the carrots in 1 tablespoon of toasted sesame seed oil for a couple of minutes, then add bok choy. 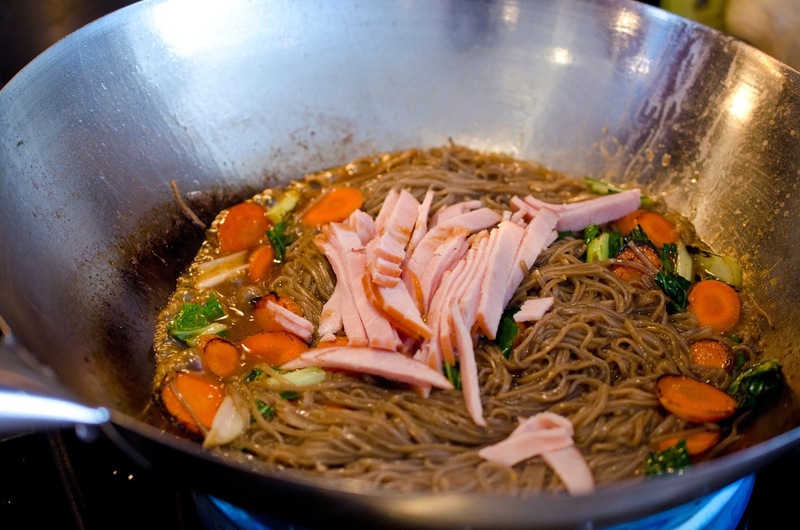 Using tongs remove soba noodles from boiling water when fully cooked and add them to the vegetables. Pour sauce on top and finish by adding Canadian Bacon. Stir fry for a couple minutes and serve hot. How did I miss this post? Yum!